The poet T.S. Eliot. The polo star Tommy Hitchcock. F. Scott and Zelda Fitzgerald. This diverse group of Americans came to Oxford in the first quarter of the twentieth century--the Jazz Age--when the Rhodes Scholar program had just begun and the Great War had enveloped much of Europe. Scott Fitzgerald created his most memorable character--Jay Gatsby, the Oxford man in the pink suit--shortly after his and Zelda's visit to Oxford. 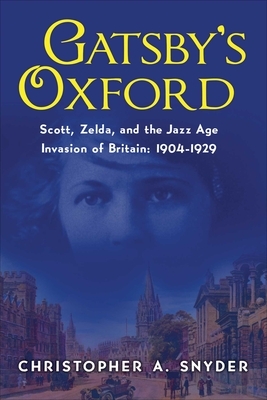 Fitzgerald's creation is a cultural reflection of the aspirations of many Americans who came to the University of Oxford seeking beauty, wisdom, and social connections. Beginning in 1904, when the first American Rhodes Scholars arrived in Oxford, this book chronicles the experiences of Americans in Oxford through the Great War and the years of recovery to 1929, the end of Prohibition and the beginning of the Great Depression. This period is interpreted through the pages of The Great Gatsby, producing a vivid cultural history. It shows just how much Fitzgerald, the quintessential American modernist author, owes a debt to the medieval, the Romantic, and the European historical tradition. Archival material covering the first American Rhodes Scholars who came to Oxford during Trinity Term 1919--when Jay Gatsby claims he studied at Oxford--enables the narrative to illuminate a detailed portrait of what a "historical Gatsby" would have looked like, what he would have experienced at the postwar university, and who he would have encountered around Oxford--an impressive array of artists including Eliot, W.B. Yeats, Virginia Woolf, Aldous Huxley, Evelyn Waugh, Winston Churchill, J.R.R. Tolkien, and C.S. Lewis.